Just on time for Christmas… Poland’s unique “Szopka Krakowska” is now inscribed on the Representative List of the Intangible Cultural Heritage of Humanity. 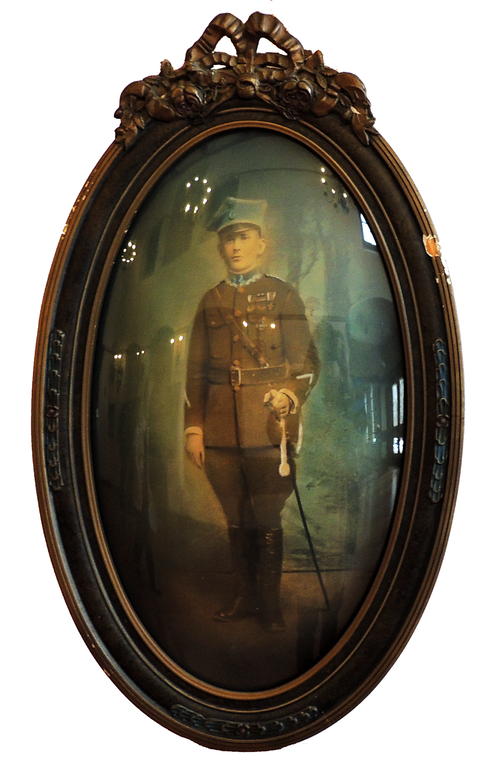 This is the first entry from Poland recognized in this way and its history can be revisited in the Christmas Tradition of “Kraków Szopka” post on our website (December 2017). Coinciding with the centennial of Poland regaining independence after 123 years of partitions, the 2018 celebration of Polish Independence Day (Narodowe Święto Niepodległości) and the American Veterans Day was particularly jubilant and reflective this year. On November 11, 2018, it was exactly 100 years since Józef Piłsudski, one of the chief architects of independence-winning strategies and first head of the reborn Poland, declared it to be the sovereign state. 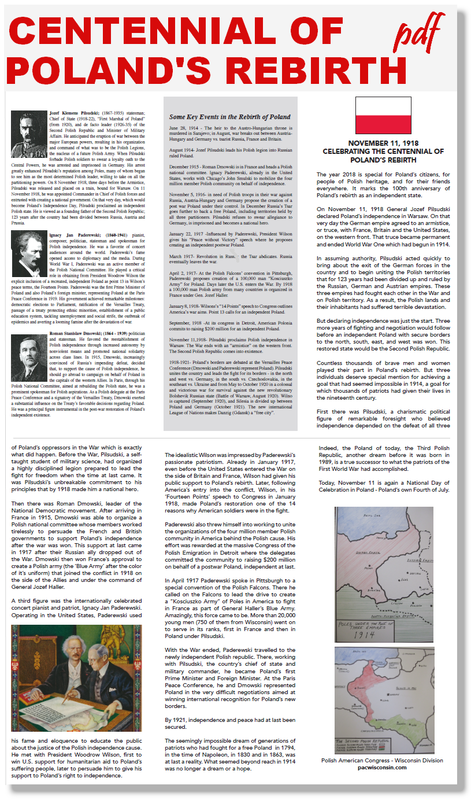 (More information about the people and events leading to Poland regaining independence is available in the PAC booklet below). In his opening remarks, David Rydzewski, current President of the Polish American Congress – WI Division, summed this momentous time in Polish history stressing that “the doers in Poland acted quickly” after the dream of generations of Poles longing and fighting for their own state came true. A new government was formed and after the national election in January 1919, a parliamentary democracy was established in Poland – although in the next three years, Poles had to shed more blood to establish its borders. 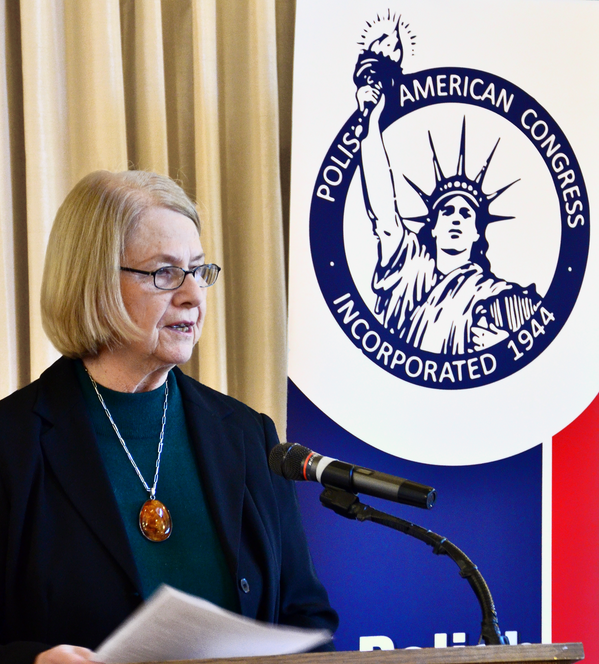 The guests could also learn more about the struggles of Polish people for independence and self-determination from the engaging speech given by Dr. Angela Pienkos, previously a history professor at Ripon and Alverno Colleges – as well as past Executive Director of Polish Center of Wisconsin, the beautiful venue where the ceremony was held. 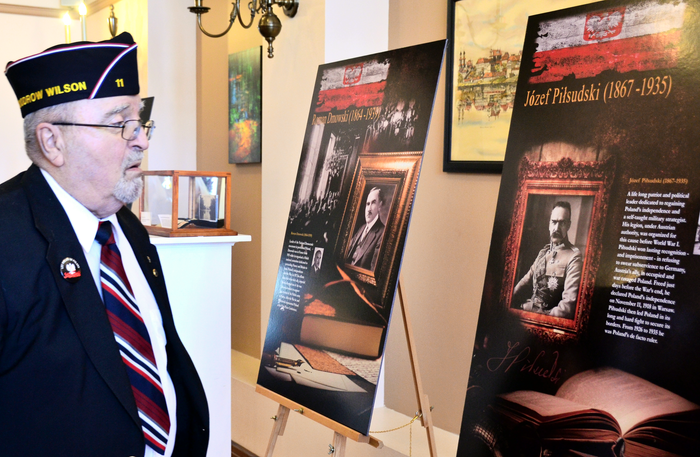 Two exhibits displayed in the spacious halls of the center provided opportunities to learn about the people and events leading to the restoration of Polish state. The stylish posters in the Grand Hall portrayed the men of victorious efforts to put Poland back on the map in the early twentieth century: Józef Piłsudski, Roman Dmowski, Józef Haller, Ignacy Jan Paderewski, John Smulski, and President Woodrow Wilson, who famously put the restoration of Polish state as one of the conditions for ending the WWI. On the other hand, the “Women of Independence” exhibit (on loan from Polanki, the Polish Women’s Cultural Club of Wisconsin) in the Veterans’ Room presented a fascinating story of Polish women fighting for freedom along the men and making outstanding contributions to science, medicine, education and the overall betterment of the Polish society. Notably, this exhibit portrays six woman elected to the Polish parliament in 1919 elections after Józef Piłsudski signed on November 28, 1918, a decree giving women rights to both vote and be elected (two years before similar rights were granted to the American women). Helping to contemplate both exhibits was the ambience of Polish patriotic music, courtesy of John Pienkos (violinist) and Thomas Gapinski (pianist) performing in the main hall of the center. The ceremony taking place in the banquet room begun with James Robaczewski, President of the Polish Roman Catholic Union of America, and John Pienkos leading the singing of Polish and American anthems. After brief greeting from Ken Skowronski, President of the Polish Heritage Alliance, an organization running the Polish Center of Wisconsin and the annual Polish Fest in Milwaukee, the event’s MC, Joanna Fraczek, announced names of honored guests attending the event (click here for their names and affiliations). This part of the event concluded with an elegant meal in Polish style following the invocation given by Deacon William Banach. The second part of the celebration began with the heartfelt salute to all Veterans, with many present in the audience. After Dr. Angela Pienkos‘ address reflecting on Poland’s struggles for freedom and self-determination, the program diverged from tradition. 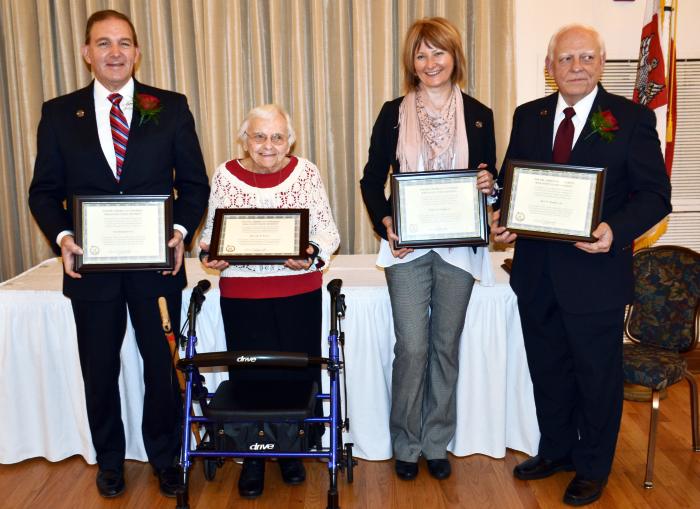 The Zablocki Civic Achievement Awards were not given out this year, although past recipients of the award present at the event were called and warmly applauded. Instead, on the historic occasion of commemorating the restoration of Polish sovereignty, the Polish American Congress – WI Division opted to present the roll of Wisconsin’s One Hundred and One Sons and Daughters of Poland. In this spectacular gesture of gratitude and remembrance, the roll includes names and deeds of Polish Americans known for their military service – mostly during the Word War I and World War II, members of Polish veteran organizations, supporters of Polish independence (also from Soviet dominance), leaders and selfless workers of relief efforts for Poland, activists of Polish American organizations, defenders of rights of Polish immigrants in America as well as promoters of knowledge about Poland’s culture and accomplishments of Polish people. As Derek Zarzeczny, PAC-WI Division Secretary, and PAC member Michael Swiatek Jr. slowly read the names from the list, the opportunity to learn and reflect on the great deeds of those outstanding individuals was singularly the most moving and pride-inducing part of the 2018 celebration of the Polish Independence Day (Narodowe Święto Niepodległości) and Veterans Day. As usual, the success of 2018 luncheon was possible thanks to talents and skills of new generations of members of the Polish American Congress – Wisconsin Division and the planning committee. In the alphabetic order they included: Irena Fraczek, Joanna Fraczek, Clare Ann Gaouette, Sharon Haberski, Teresa Jankowski, Michal Korzeniecki, Dr. Angela Pienkos, Dr. Don Pienkos, John Pienkos, Ruth Pilarzyk, David Rydzewski, Michael Swiatek Jr. and Derek Zarzeczny. Specials thanks go also to these generous sponsors of the event: The Polish Legion of American Veterans, State Department of Wisconsin (Casimir Pulaski level $500) and several contributors at the Marie Sklodowska Curie Level ($250). 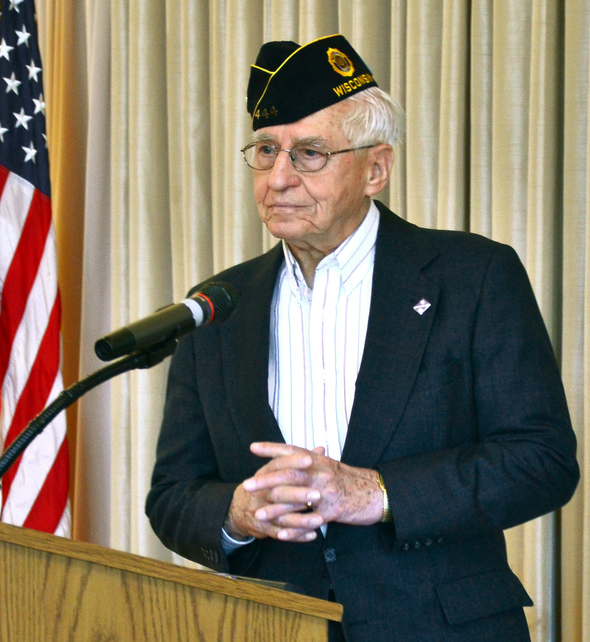 The latter include Kobus Molenda Post 49 of The Polish Legion of American Veterans, Mr Alvin Czysh in memory of his wife Shirley, Friends of the Kosciuszko Foundation’s Wisconsin Study In Poland Scholarship, and The Milwaukee Society, Lodge 2159 of the Polish National Alliance. Thank you also to guests participating in the fund rising raffle and its donors: Judith Free, Ewa Barczyk, Neal Pease, Donald and Angela Pienkos, Jacek and Kasia Niemczyk, Clare Ann Gaouette, Ruth Pilarzyk, and David Rydzewski.